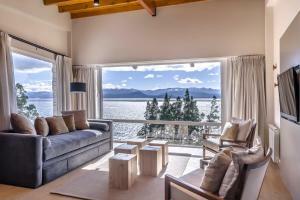 Miralago I is a self-catering accommodation located in San Carlos de Bariloche. Free WiFi access is available. The property is 4 km from Civic Centre and 5.5 km from Nahuel Huapi Lake. Featuring a balcony with outdoor furniture and lovely views of the lake, this apartment is equipped with a flat-screen TV, full kitchen facilities, a wardrobe and heating. It is also fitted with a wardrobe, a sofa and a complete bathroom. Bed linens and towels are provided. At Miralago I guests can unwing in the garden. The apartment offers free parking. Miralago I is 4.5 km from National Park Nahuel Huapi and 5.5 km from Cerro Catedral Ski Resort. San Carlos De Bariloche Airport is 17 km away. When would you like to stay at Miralago I ? This apartment includes a balcony with outdoor furniture and views of the lake. It is equipped with a flat-screen TV, full kitchen facilities, a wardrobe and heating. This unit features a wardrobe, a sofa and a complete bathroom. Bed linens and towels are provided. Each day we'll check prices and send you an email for your selected dates at Miralago I. If you don't have specific dates but would like to check prices for say next weekend or say next month we can check the price too. Click to write a review and share your experience of Miralago I with other travellers.